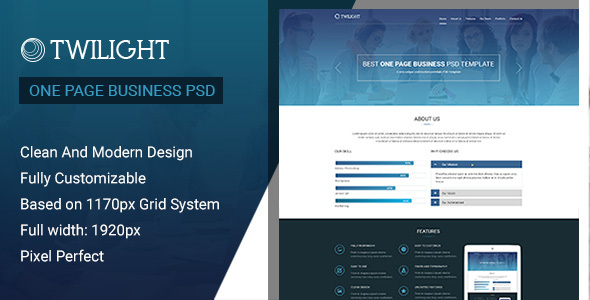 Twilight One Page Business PSD Template, is a Pixel-Perfect, thoughtfully-designed PSD template for small business, corporate or agency websites. It is a stunning PSD template that has been created based on the typical requirements of a business, agency, corporate website. It is built on 12 Column grid(1170px). This template has been created by CyberChimps, that is very well-known for its Premium Responsive WordPress Themes. You can rest assured their team of experts have brought the same level of expertise to this PSD template as well. mentioned in the credits installed.You need to open Photoshop. Go to Window > Layers (F7) to show the Layers Panel. As you can see at bottom, the layers are well organized and grouped into folders,which make editing very easy.